Pacific Asia Museum will hold its 35th annual Festival of the Autumn Moon on Saturday, Sept. 29, at the California Club in downtown Los Angeles. The event will begin with a reception and silent auction at 5:30 p.m., followed by dinner and the evening program at 7:30 p.m. The theme of this year’s event is “Celebrating Japan,” coinciding with the 100th anniversary of the gift of 300 cherry blossom trees from Japan to the United States. 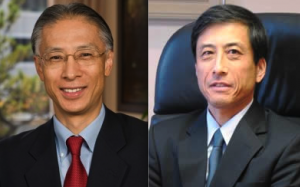 The honorees at this year’s event are Jun Niimi, consul general of Japan in Los Angeles and Masashi Oka, CEO for the Americas of the Bank of Tokyo-Mitsubishi UFJ (BTMU) and president and CEO of Union Bank. These individuals will be recognized for their service to the community. Niimi began his tenure in October 2011. As the official representative of the government of Japan, his primary duties include the protection of Japanese nationals as well as further strengthening the already close bonds of friendship enjoyed by Japanese and Americans in Southern California and Arizona. The consul general works closely with his staff and partners within the community to provide consular services, to promote Japanese business, and to support Japanese and Japan-related organizations and activities. Oka has oversight for BTMU’s business in all of the Americas, including Canada and Latin America. Union Bank is a wholly owned subsidiary of BTMU and a member of the Mitsubishi UFJ Financial Group Inc. (MUFG), one of the world’s largest financial organizations. Oka has served in his current role as president and CEO of Union Bank since July 2010 and BTMU CEO for the Americas since May 2012. In addition to commemorating the centennial of diplomatic relations between Japan and the U.S., Festival of the Autumn Moon is also the culmination of Pacific Asia Museum’s focus in 2012 on Japanese art and culture. The museum organized and opened three Japanese exhibitions earlier in the year, “Kimono in the 20th Century,” “Gajin Fujita: Ukiyo-e in Contemporary Painting,” and “Masterpieces of Tsukioka Yoshitoshi.” Several educational programs related to the exhibitions were also presented at the museum to bring Japanese art and culture to the public. Festival of the Autumn Moon will begin with a reception and silent auction. Guests will be able to bid on unique art and home décor, dining and entertainment packages, and travel items. The dinner portion of the evening will feature programming, a live auction and a raffle drawing. Currently, only tickets for the reception and silent auction portion of the event are available, beginning at $150 per person. For ticket availability and more information, contact Jenny Lin, development director, at (626) 449-2742, ext. 28 or [email protected] All proceeds from this event benefit the innovative exhibitions and dynamic programming at Pacific Asia Museum. Pacific Asia Museum is among the few institutions in the U.S. dedicated exclusively to the arts and culture of Asia and the Pacific Islands. The museum’s mission is to further intercultural understanding through the arts. Since 1971, it has served a broad audience of students, families, adults, and scholars through its education and outreach programs. The museum is located at 46 N. Los Robles Ave. in Pasadena and is open Wednesday through Sunday from 10 a.m. to 6 p.m. Admission is $9 general, $7 students/seniors, and free for museum members and children under 12. Admission is free every fourth Friday of the month. For more information, visit www.pacificasiamuseum.org or call (626) 449-2742.